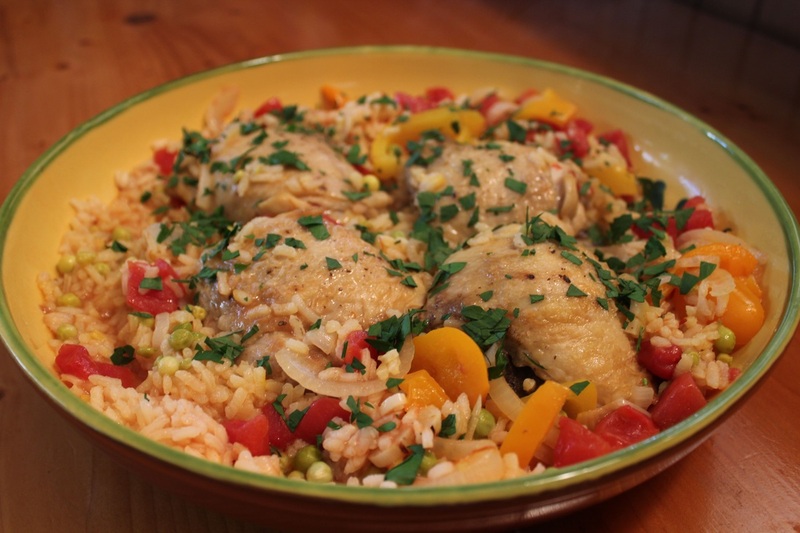 This Spanish chicken and rice recipe is fantastic because of it's simplicity, color and flavor. I love making one pan-meals, especially because of the ease during clean-up. This one is beautiful and flavorful enough to serve to guests too. Rinse and dry chicken pieces. Cut onion and bell pepper in half, then thinly slice both onion and bell pepper. Separate onion pieces. Remove skin from garlic, thinly slice. Heat oil over medium-high heat in a large skillet, brown chicken on both sides. Remove chicken from pan and set aside. In the same skillet, saute onion, bell pepper and garlic until soft. Add tomatoes, peas, rice, warm chicken broth and saffron bringing to a simmer. 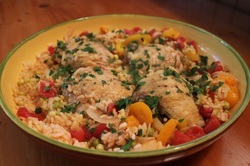 Place chicken on top of rice/vegetable mixture, reduce heat, cover and cook 25-30 minutes or until chicken is done and rice is tender.